This morning as I was working out in the little gym in town, I opened the door to let in the gorgeous view of the fall colors in the distance, some fresh autumn air, and a little more light. 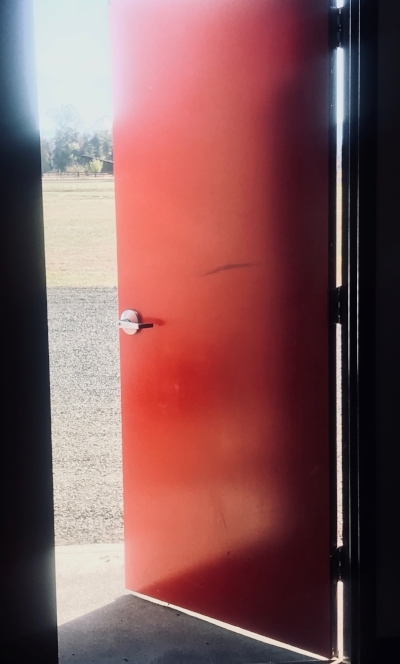 I was facing the door while lifting some weights, when a slight breeze picked up outside, and the door slowly and quietly began to shut. It stopped about two-thirds of the way, leaving only a third of the view, fresh air, and light. I’d forgotten to prop it open with a rock. It is safe to say that while I am squarely in the third-third of my life, there is still a lot out there that is mine to do. More words to write, more retreats to lead, more stages from which to speak, more clients to coach, more work on which to collaborate, more adventures with the love of my life, more time with the “littles” in our family, more time with those I love, and, more to discover every step of the way. In order to make good on what is still mine to do, I have to keep the door to whatever that is open. An open door keeps our vision in front of us, breathes fresh air into our work, and shines light on our steps. But the door won’t stay open of its own accord. We have to prop it open with our rock-solid commitment to pursuing the good work to which we are called, the authentic, whole-hearted lives that we are here to live, and the people whose hearts we are here to love and to touch. The door to the life that is ours can begin to close, ever so slowly and quietly, if we don’t remember to prop it open with a rock.